Twelve images of the Moon: three cameras, six lenses and a telescope are used to photograph the Moon in twelve different scenarios. Many of these images were shot in a 50 hour period bracketing the Super Moon of November 2016 - my exploration of the tradeoffs in capturing context and lunar detail with different lenses. Most images were recorded with a Sony alpha 6300 24 mega-pixel, APS-C sensor camera or a 16 MP APS-C Sony NEX-5N. These 1.5 crop factor cameras are representative of modern DSLR class cameras. The best camera is the one you have with you, so I've included a point and shoot camera in the mix. Images are ordered by increasing lens focal length and approximate horizontal field of view. A mix of vintage and modern lenses are used ranging from a 12 mm ultra wide angle to a 1350 mm telescope. Processed images range from single images, to 2 image HDR composites, and deconvolved stacks of many lucky images. Approach, exposure, dynamic range, foreground context, and post processing are summarized for each shooting situation. Both a reduced version of the full image and a detailed crop are shown for each. These examples and descriptions will help you choose the equipment, settings, and techniques you need to get your Moon image. All you need to get started are: a camera, tripod, and a remote shutter release. You can cheat on the last two: a multi shot continuous shooting mode can substitute for a tripod, a shutter delay can replace a remote shutter release. A bright Moon in a dark sky fools any auto-exposure system. Set manual exposure and focus. Focus carefully and don't over expose the Moon. 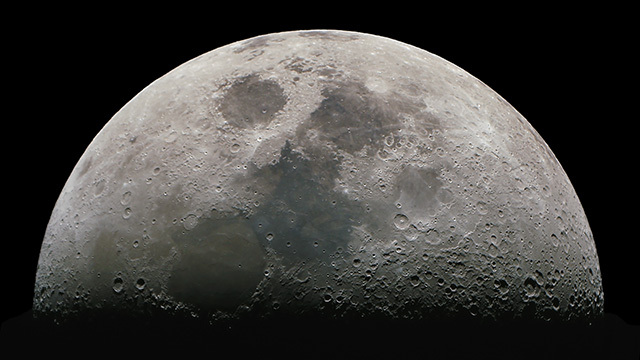 Wide angle, short focal length, lenses reduce the Moon to a secondary character, at best showing its shape and suggestions of the lunar maria. Emphasis is on the scene - landscape, clouds, and moonlight. With an APS-C camera the field of view is nearly 90 degrees. This image was shot in the Garden of the Gods in Colorado Springs in August of 2015 using a Sony NEX-5N camera and a Rokinon 12 mm f2 lens. 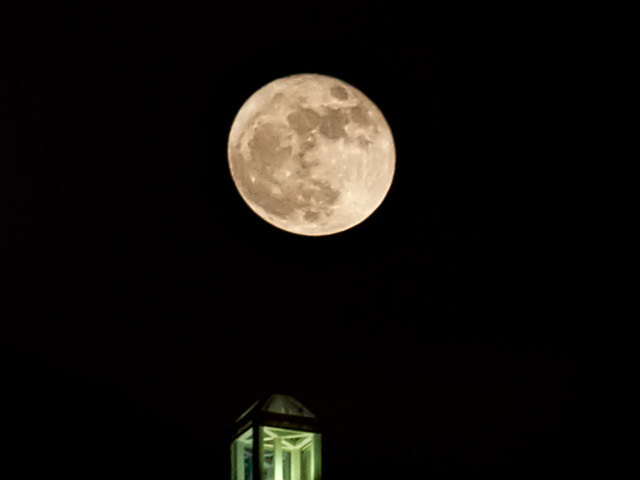 Two exposures were used: 1/25 sec for the Moon and 15 sec at ISO 200 to capture the landscape with HDR compositing in Photoshop. The lighting and treeline shadow were provided by a spotlight from a nearby resort. 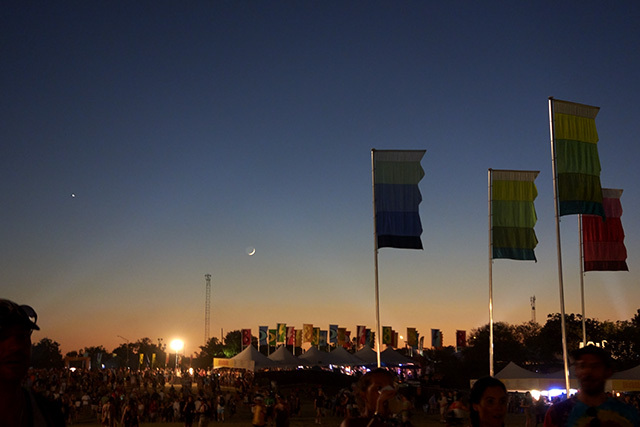 A hand held image taken with a point and shoot camera at the Austin City Limits Music Festival of the Moon and Venus. With a normal lens like this, expect a FOV of close to 35 degrees. Continuous shooting mode is workable substitute for a tripod when the focal length of the lens isn't too long. This is a single image picked from several dozen from a Sony RX-100 a 20 MP 2.7X crop factor camera. Exposed at f3.5 for 1/13 sec at ISO 800 with the zoom lens at a focal length of 20.6mm - equivalent to 38 mm on an APS-C sensor camera. 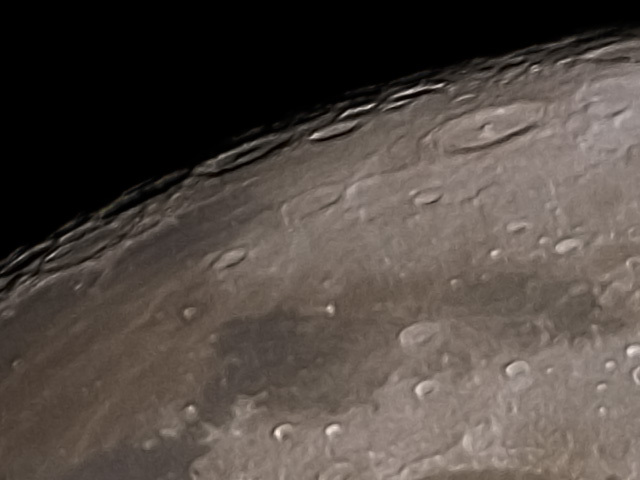 A normal to short telephoto shows details of the lunar maria and a half dozen major craters. A field of view of around 20 degrees captures substantial foreground context, in this case an urban landscape. 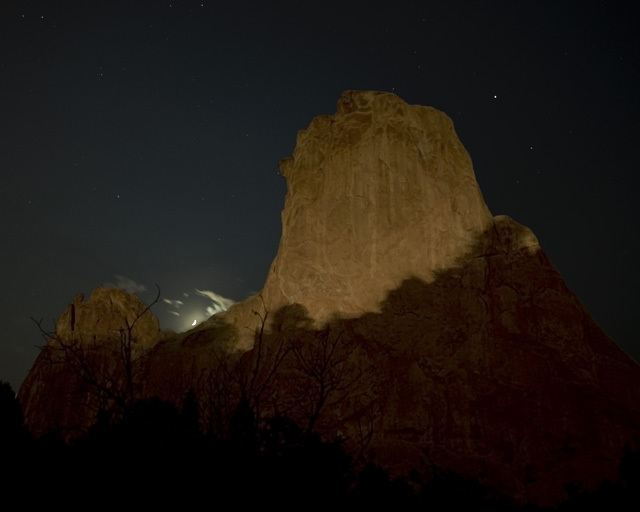 Multiple HDR exposures are needed to show lunar detail in a night shot like this. At dawn or dusk there can be enough light on the landscape to capture both the scene and lunar detail in one exposure, but not when the sky is this dark. 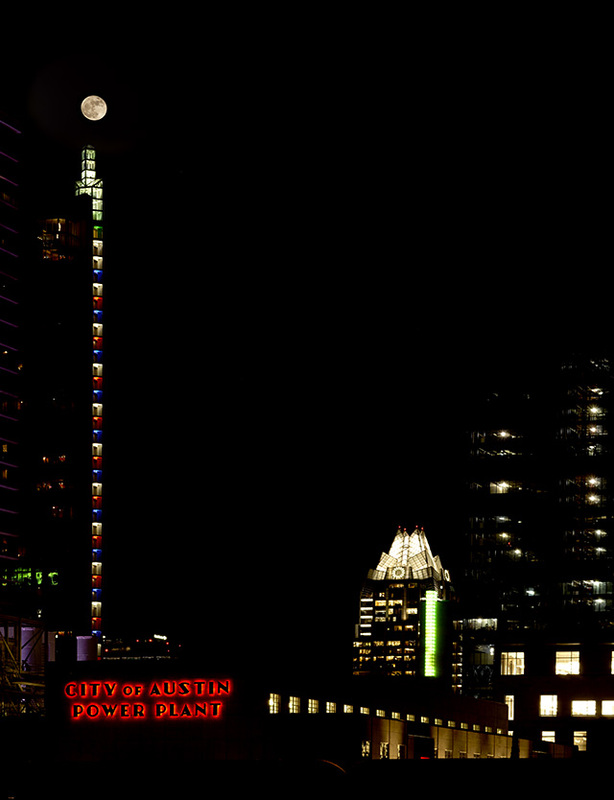 This image, captured in downtown Austin, uses the Sony alpha 6300 24 MP camera with a Sigma 60mm f2.8 lens. 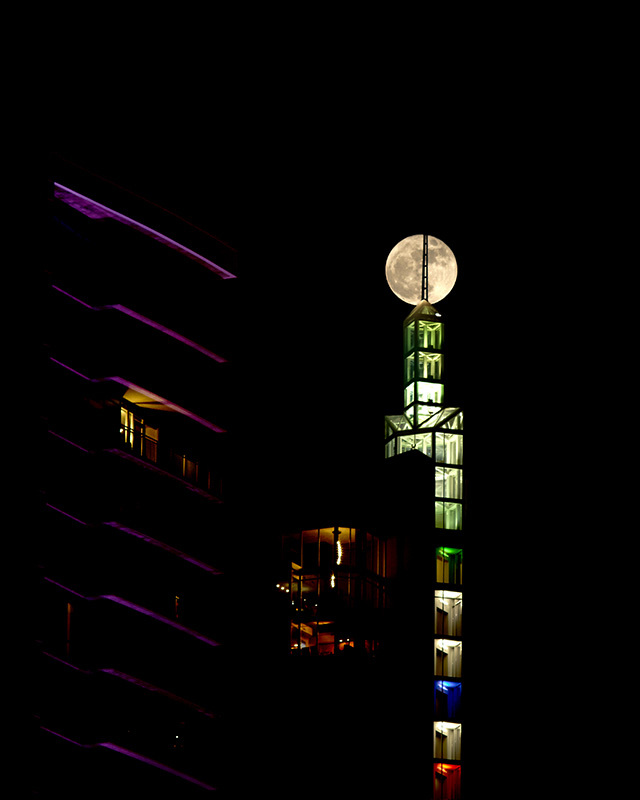 This is a two image HDR composite, necessary to capture the wide range of exposure between the building lights and the Moon at night. Exposed at f8 and ISO 100, foreground for 1 sec and Moon for 1/200 sec. HDR composition and perspective correction in photoshop. The next images use a vintage manual Vivitar 135 mm f2.8 lens with the Sony a6300. 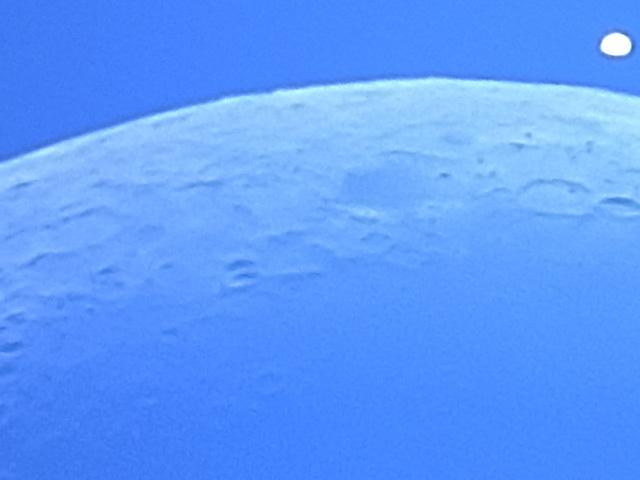 A medium telephoto like this can capture substantial lunar detail while including some landscape context. 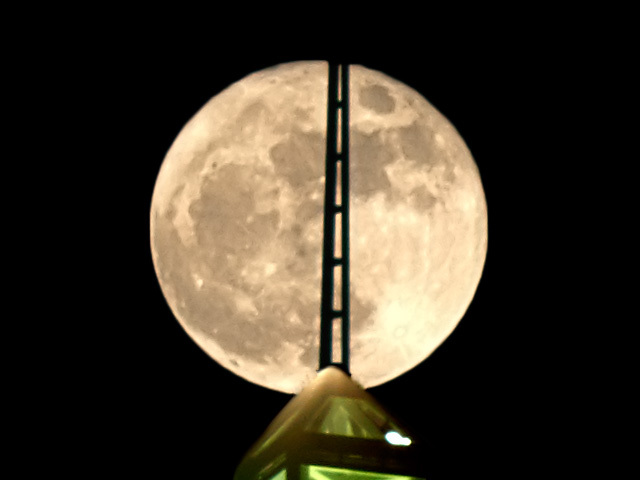 The urban night shot requires a multiple exposure HDR composite to correctly expose lunar detail. 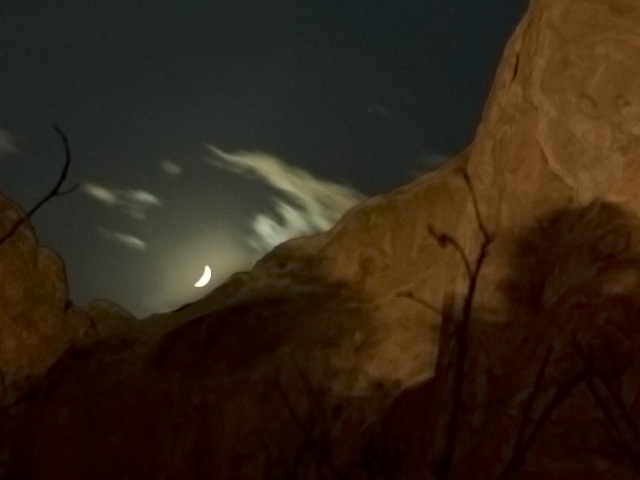 Two images, a 1/200 sec exposure for the Moon and a 1 sec exposure for the foreground at f 5.6 and ISO 100. HDR composition and cropping in photoshop. 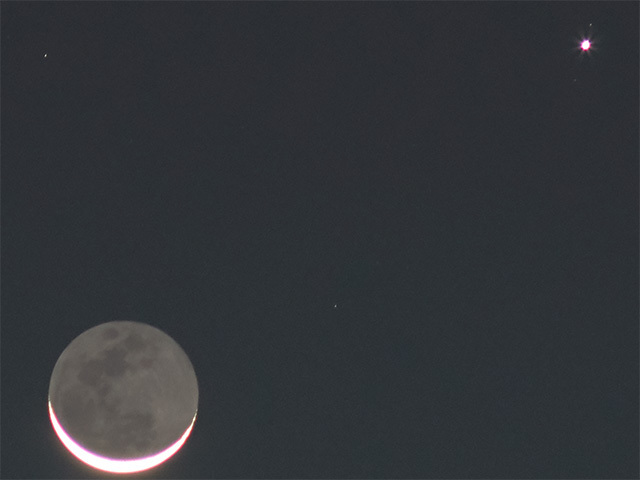 This predawn image of a conjunction of the Moon and Jupiter using the Vivitar 135 mm f2.8 lens is a single exposure. Taken from my driveway, a house light gives some color to the silhouetted trees. The lunar crescent is overexposed, both the earthshine lit Moon and even Jupiter's moon Callisto are captured at f4 for 1 sec at ISO 400. The crop below is shown 2:1 so that Callisto is visible above Jupiter in the frame. 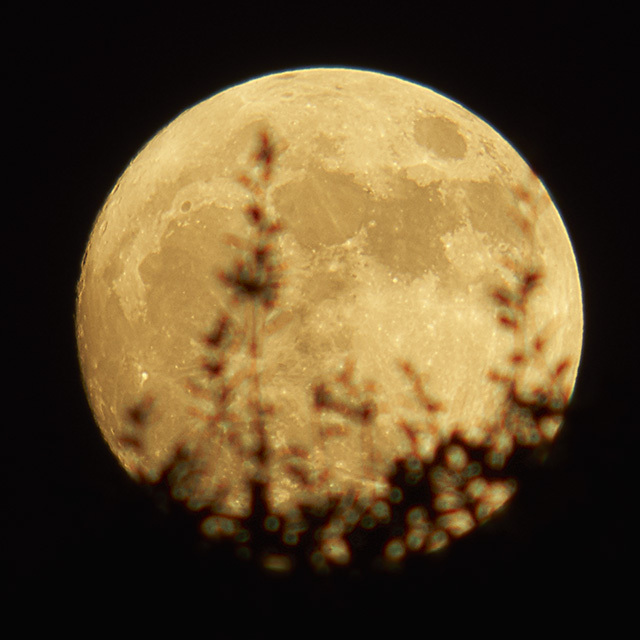 The Super Moon setting, a single exposure, with the Sony a6300 and Vivitar 135 mm f2.8 lens. Exposed at f8 for 1/8 sec and ISO 100. Taken at dawn in a suburban Austin park, the brightening sky highlights the tree branches in silhouette. 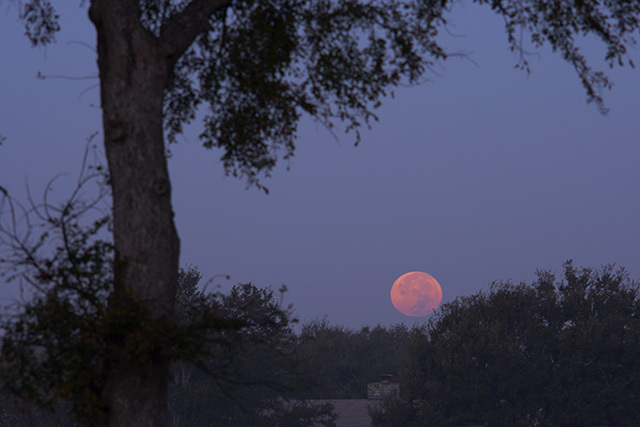 The thicker atmosphere near the horizon dims the Moon reducing the exposure range to what a single image can capture. A minor exposure stretch was applied Photoshop. The Super Moon setting just above the horizon, taken a few minutes after the image above, using a longer Vivitar 200 mm f3.5 lens with the Sony a6300. 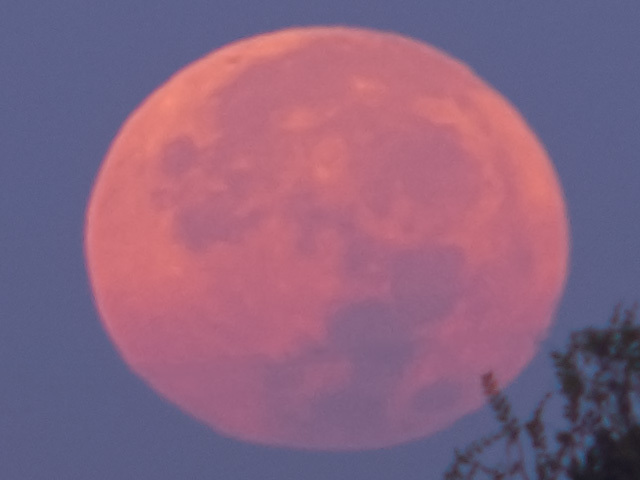 Some colors are visible in the landscape and the Moon has a deeper red color. 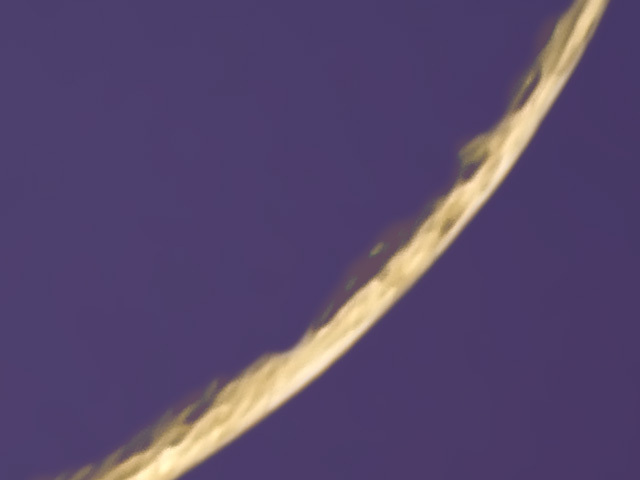 The turbulence near the horizon reduces the detail visible in this image. Exposed at f8 for 1/3 sec at ISO 100. 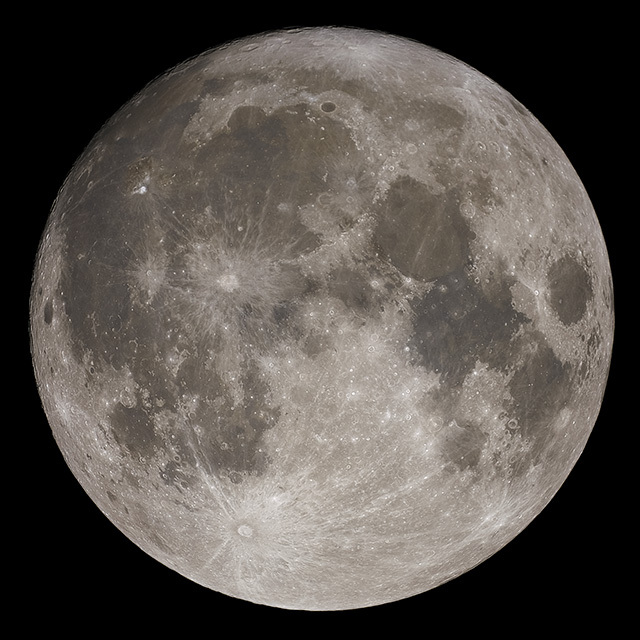 A longer focal length lens doesn't have the field of view to capture much context around the Moon. Substantial lunar detail is visible. Silhouettes of branches or passing planes and birds can add interest. 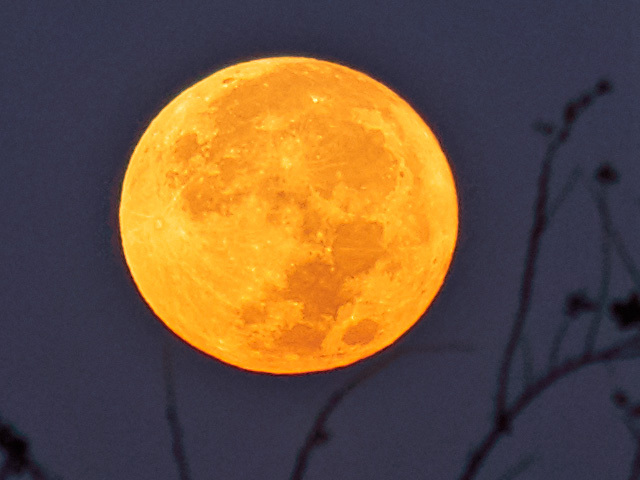 This moonrise image was taken with the Vivitar 200mm f3.5 lens with a Vivitar 2X teleconverter added. The single image was exposed at f8 for 1/8 sec at ISO 100 with final crop and exposure adjustments in Photoshop. Telescopes with 1200 - 1400 mm of focal length are a great match for full disk images of the Moon with an APS-C sensor camera. An entire lunar disk will fit in a single shot. Small telescopes with 75 to 100 mm objectives will make full use of the resolution of 16 to 24 mega-pixel APS-C sensors. Careful post processing is essential for sharp, low noise, final images. Stacking the best "lucky" images from a set increases the clarity and reduces noise in the base image. Deconvolution or wavelet sharpening algorithms recover resolution, rather than only fooling the eye like the unsharp mask algorithm. Stretching image exposure makes the best use of the limited dynamic range of screens and prints. Full Moon shots through a telescope are difficult because of low contrast. 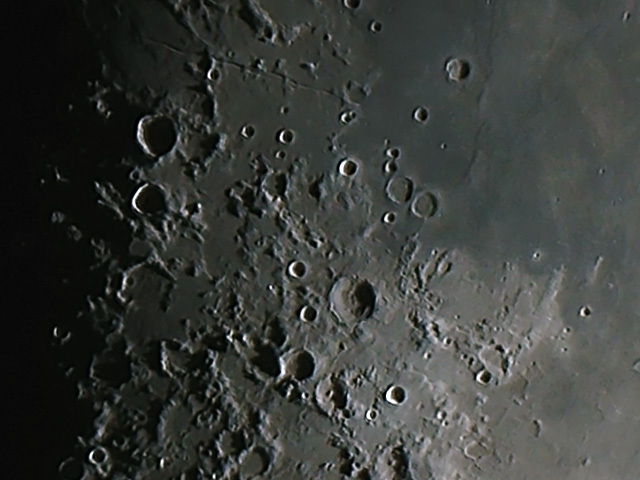 With the sun overhead on the Moon, short shadows reduces the amount of visible crater detail. This image was shot with a very compact Questar 3.5" Maksutov Catadioptric telescope. At the rear camera port, the telescope is a 1350 mm f15 lens. The final image was made from the best 8 of 93 images stacked with 8 parameter affine transforms in Nebulosity. It was deconvolved in Lynkeos to increase detail with the final crop and exposure adjustment in Photoshop. Clear crescent Moon shots are rare. 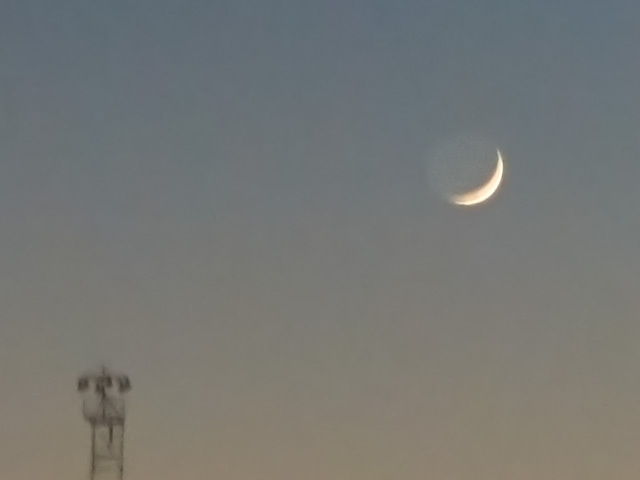 Increased atmospheric turbulence, in low angle shots near the horizon, distort the Moon's image. With reasonable seeing and stacking lucky good images detailed images are possible. Depth of field is very narrow in a long focal length telescope. 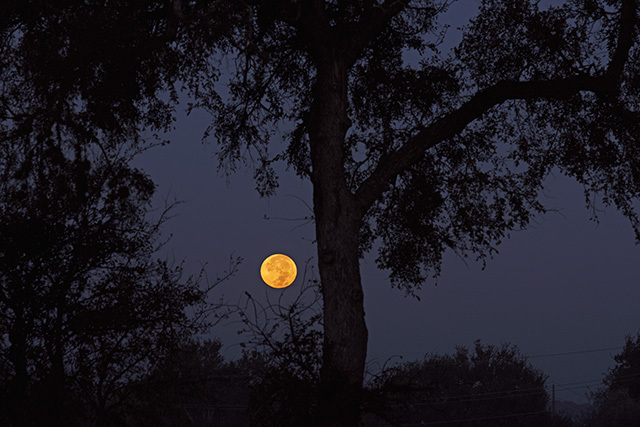 This image is a composite of two focus points: one for the stack of Moon images, and one with the focus biased toward the tree. Questar 3.5 with Sony NEX-5N at prime focus. Moon exposure 0.5 sec and trees 1.3 sec at ISO 800. 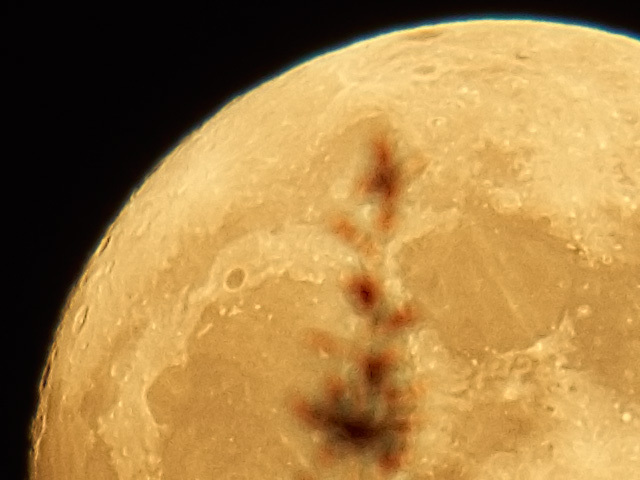 33 Moon frames stacked with 8 parameter affine transforms in Nebulosity, deconvolved in Lynkeos, stacked with in focus tree image and final tweaks in Photoshop. Close lunar conjunctions and occultations with stars and planets are great opportunities for interesting images even with the narrow field of view with a long focal length telescope. Daytime is a great time for these images. Stacking to reduce noise is important. 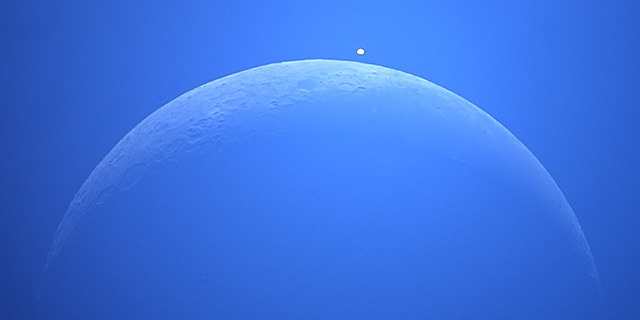 Lunar occultation of Venus December 7, 2015 17:01 UT Questar 3.5 with Sony NEX-5N at prime focus, ISO 200 for 1/125 sec, 10 image stack Lynkeos / Photoshop. 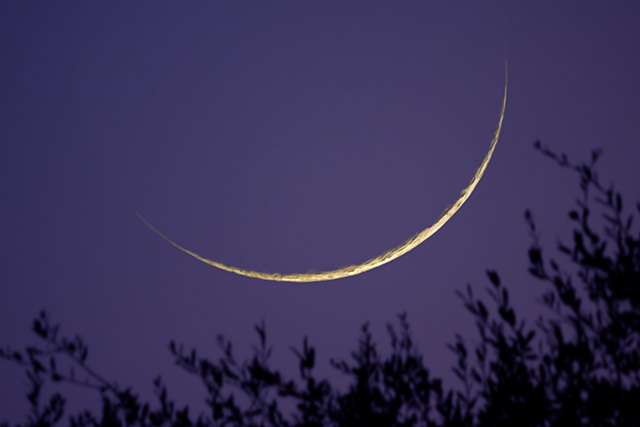 The crescent Moon with earthshine can be a spectacular image. Except for the thinnest crescent Moon a single exposure that captures the earthshine will leave the crescent hopelessly overexposed. Extreme HDR techniques are needed to capture both earthshine and the crescent Moon in detail sometimes as many as ten exposures are used. 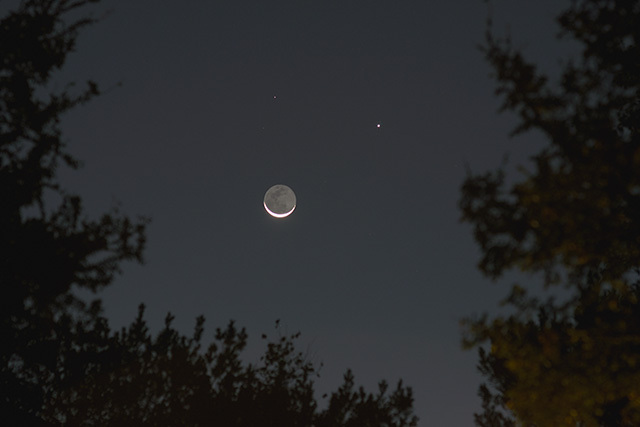 I have a separate note describing a much simpler daylapse technique for HDR images of earthshine and the crescent Moon.